Along with the Honor 7X, the Huawei sub-brand also announced a new Android tablet at its event in China. The WaterPlay, as you can probably guess by its name, is a water-resistant tablet. With an IP67 rating, the tablet can stay submerged under fresh water up to 1 meter deep for a maximum period of 30 minutes. The tablet features a metal unibody design, adding a premium touch. The tablet features a 10.1-inch 1920 x 1200 WUXGA resolution display with 70% coverage of the NTSC color gamut. Running under its hood is the same Kirin 659 chip that powers the Honor 7X. The 64-bit octa-core processor is clocked at a high 2.36 GHz and includes a Mali-T830 MP2 GPU to handle the graphics processing. Honor is offering the WaterPlay in two memory configurations - 3GB RAM + 32GB onboard storage and 4GB RAM + 64GB onboard storage. For further expansion, there is a microSD card slot on offer, accepting microSD cards up to 256GB. At the rear, Honor WaterPlay features an 8-megapixel resolution snapper that you can use to capture the occasional photo and video with. For some off reason, Honor hasn’t revealed the exact resolution of the front-facing camera. However, it did reveal that the front camera is capable of capturing photos with a background blur effect, a feature we haven’t seen on a tablet before. 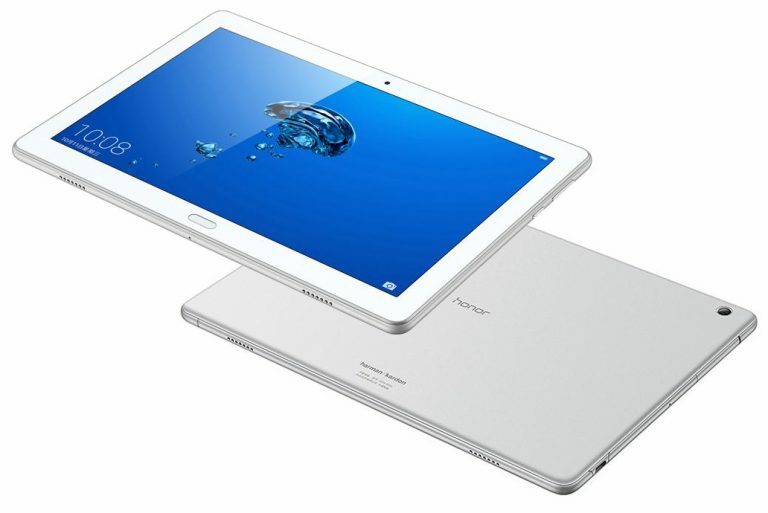 Another impressive feature of the new Honor tablet is that it features Huawei Histen 3D audio technology with stereo speakers tuned by Harman Kardon. Honor has equipped the tablet with a 6660mAh capacity battery with fast charging support, allowing it to be fully charged in just 2.5 hours. The company claims the tablet can deliver up to 12.8 hours of video playback time and 9.3 hours of web browsing. Connectivity features include Wi-Fi 802.11 ac dual-band, Bluetooth 4.1 Low Energy, GPS with A-GPS, GLONASS, USB Type-C port, and optional 4G LTE. There is even a fingerprint sensor on offer, embedded inside the physical home button below the display. The tablet measures 248 x 173 x 7.8mm and weighs in at 465 grams. What we find slightly disappointing is that the Honor WaterPlay will ship with Android 7.0 Nougat based EMUI 5.1 software and not the newer Android 7.1 version. Honor WaterPlay is now available for pre-order in China and will be going on sale in the country October 24th onwards. The base 3GB RAM version is priced at 1999 yuan ($303), while the 4GB RAM version is priced at 2399 yuan ($364). The 4GB RAM version with LTE support costs 2699 yuan ($410). In terms of color options, the Honor WaterPlay will be available in Champagne Gold and Silver.